Last month we brought you news that Vertigo was attempting a Lost Boys revival in comic-book form, portraying the ongoing efforts of Sam Emerson and the Frog Brothers to wipe out all the damn vampires in Santa Clara, California. Little did we know, though, that Lost Boys revivals are like house centipedes. Which is to say, if you see one crawling around, it means there’s probably a billion more skulking around in your baseboards, just waiting to emerge and scare your bejeezuses out. Now Deadline is reporting that Veronica Mars and Party Down creator Rob Thomas—who’s done so much for supposedly used-up monster archetypes with his pleasantly light iZombie—is working on a Lost Boys TV revival of his own. The series is being developed at The CW—as if that actually needed to be said—which recently announced that one of its most successful supernatural teen dramas, The Vampire Diaries, was coming to a close. 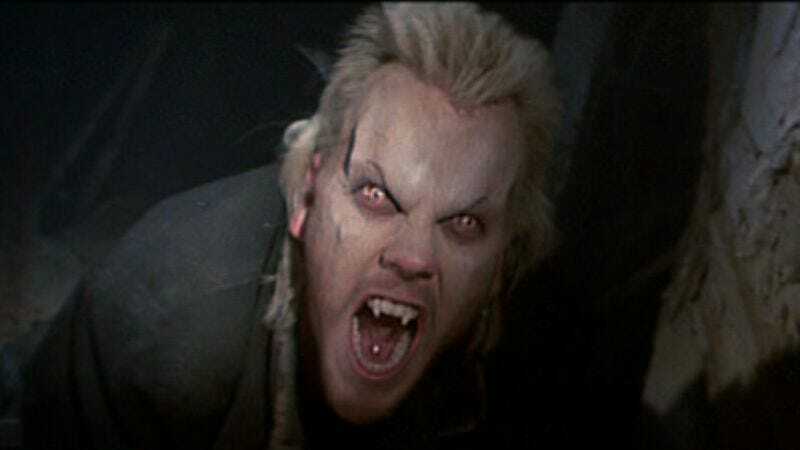 But the craziest thing about this new Lost Boys show is just how ambitious Thomas’ design doc for it seems to be. He’s apparently envisioning a “seven-season run” that “will tell a story spanning 70 years, each season chronicling a decade,” with the only recurring characters being the titular bloodsucking ne’er-do-wells as they rampage across the 20th century. On the one hand, Thomas’ idea seems like a natural outgrowth of the recent reemergence of anthology TV, and a clever use of the show’s immortal characters. On the other, we can’t imagine the confidence it would take to walk into a network office and say, “I want to remake The Lost Boys, as a period piece”—the first season is reportedly set during The Summer Of Love—“and I want seven seasons to do it in.” Thomas—who’s working with Gulfstream TV, and whose pitch for the show apparently earned competitive attention from at least two networks—definitely gets points for chutzpah if nothing else.